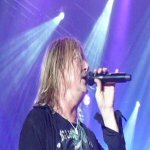 Def Leppard singer Joe Elliott was interviewed in late July by Ron Keel for Radioscreamer and talked about more 2014 tour dates yet to be announced. Joe talked about the Down 'n' Outz album, Mott The Hoople, Ian Hunter, touring with KISS, the upcoming Down 'n' Outz tour, more 2014 tour dates in October, the 2015 studio album and a second residency. A likely place for these tour dates could be South America given Joe's recent news of Australia/NZ, Japanese, North American and UK/European dates on their 2015 world tour. You'll remember from the last two years they've mentioned trying to set up a tour there. A private show in Las Vegas, NV was recently announced by McAfee as part of their annual security conference on 29th October. These other shows will likely be played at the same time. Vivian's inclusion remains unclear as he is due to have more treatment after the KISS tour. "We've got an album to finish. As soon as we've touring mid-September, apart from a week's worth of gigs in October, we've got an album to finish. So that we can get back out and do this all again next year."